High floor one bedroom condominium with full-time doorman, private terrace and open views! Welcome home to this bright and airy home flooded with light from two floor to ceiling windows facing northeast, away from the Avenue, and clearing adjacent buildings providing for an unusual combination of openness and quiet. A well proportioned open kitchen has stainless steel appliances and is the perfect place to prepare dinner for your guests in an oversized living room. Step out on your private terrace and enjoy the sunrise as you sip your morning coffee. The generous bedroom is the perfect place to get away from the city and is a peaceful oasis. 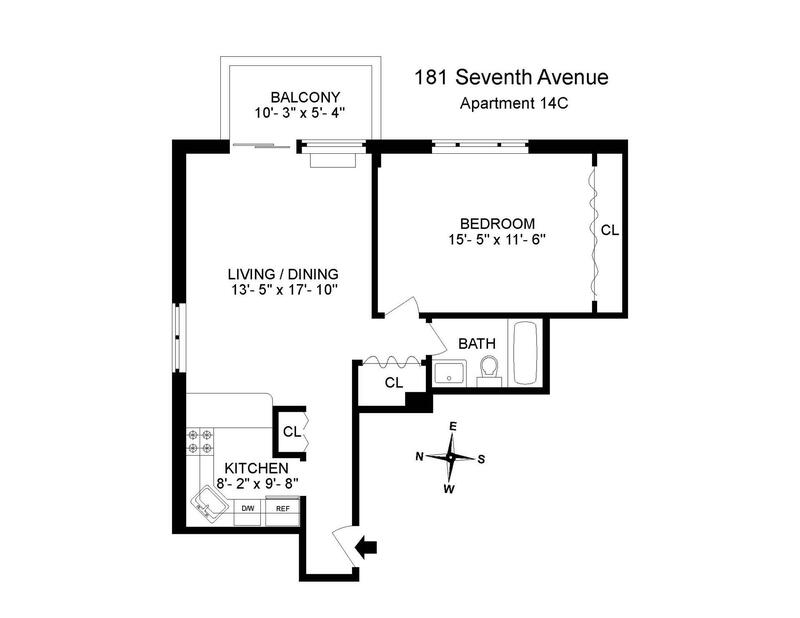 181 Seventh is a well maintained pet-friendly condominium with twenty-four hour doorman, on-site laundry and bike room. The location is the definition of convenience with Whole Foods, Trader Joe's, Chelsea Market, the High Line and some of the best restaurants and bars in the city right outside.